Abu Dhabi, UAE (18 January, 2011) – His Highness General Sheikh Mohammed bin Zayed Al Nahyan, Crown Prince of Abu Dhabi and Deputy Supreme Commander of the UAE Armed Forces, today presented the prestigious US$1.5 million 2011 Zayed Future Energy Prize to Danish manufacturer of wind turbines, Vestas, in recognition of its outstanding leadership to pioneer wind energy, even during periods where demand for renewable energy waned. Vestas has played a major role in forging a path for the renewable energy industry. It has made more than 41,000 turbines for customers in 65 countries across five continents – creating more wind power capacity than any other company. The company’s turbines generate more than 60 million MWh of energy each year, enough to power 21 million people. His Highness General Sheikh Mohammed bin Zayed said: “The Zayed Future Energy Prize reflects the vision of the late Sheikh Zayed bin Sultan Al Nahyan, the founding father and the first President of the UAE, who was aware – even decades ago – of the importance of reaching a balance between preserving the environment and maintaining economic growth. It is his vision that has forged a unique path for the UAE, and has served as a beacon for us to follow as we begin to harness new sources of power and ensure we preserve the local heritage and natural resources. “In commemoration of this humanitarian approach, the award was established to recognize and motivate creative minds and innovators in the field of renewable energy, with the ultimate purpose of maintaining a healthy and clean environment for future generations,” HH General Sheikh Mohammed added. Vestas was selected for its outstanding scale of achievement and its enviable track record – evolving from a country with little energy resources to a global leader in delivering renewable sources of power. For the past 30 years, Vestas has firmly promoted and established clean, renewable wind power as a mainstream and sustainable energy solution. The judges were particularly impressed with the company’s long-term vision, demonstrating the ability to scale up through a commercially-viable business model and for its outstanding contribution to the renewable energy industry. The winner and the runner-up awards were chosen from a total of 391 submissions from 69 countries. Amory B. Lovins, Chairman and Chief Scientist of the Rocky Mountain Institute was awarded a runner-up prize of US$350,000 for his work on an “integrative design” methodology for energy efficient buildings, vehicles and factories. Lovins describes his designs as a powerful and globally applicable new tool for shifting rapidly from oil and coal to efficiency and renewables. E+Co, a clean-energy investment company, was also awarded a runner-up prize of US$350,000 and congratulated for its pioneering investments in the developing world. It supports and invests in small and growing clean-energy enterprises in developing countries to impact climate change and energy poverty. The winner and the two runner-ups were selected by a jury of business and political leaders through a rigorous and transparent, four-tier evaluation process. The 2011 Zayed Future Energy Prize jury was led by Dr. R.K. Pachauri, the 2007 Nobel Peace Prize Laureate and Chairman of the Intergovernmental Panel on Climate Change. Jury members include: Ólafur Ragnar Grimsson, President of the Republic of Iceland; H.E. Eng. Khaled Irani, Minister of Energy and Mineral Resources, Jordan; H.E. 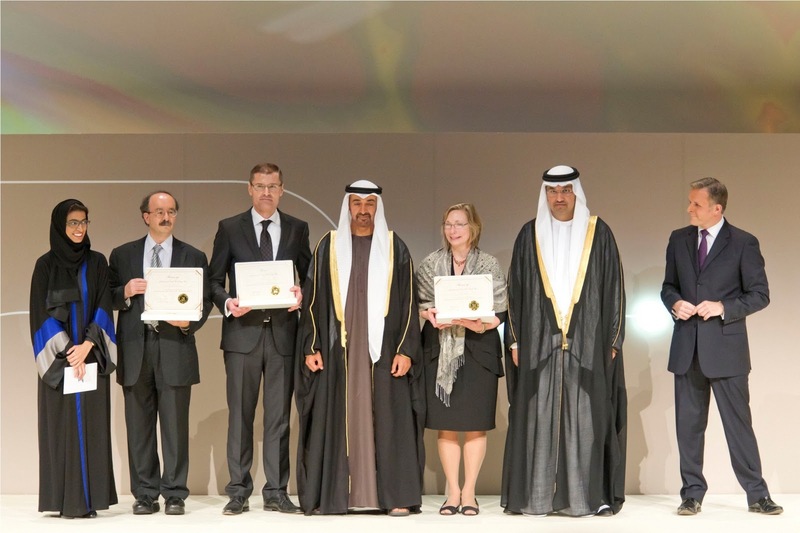 Ahmed Ali Al Sayegh, Chairman, Masdar; Lord John Browne, Managing Director of Riverstone Holdings; Lord Norman Foster, Founder and Chairman, Foster and Partners; and Dr. Susan Hockfield, President, Massachusetts Institute of Technology. · Barefoot College, the only fully solar electrified college in India, for training woman in rural areas to contribute to solar energy development. The college believes the very poor have every right to have access to, control, and manage and own the most sophisticated of technologies to improve their own lives. · First Solar, solar modules manufacturer based in Arizona, for its commitment to solar energy and the development of more efficient thin film solar modules. First Solar has developed an innovative photovoltaic technology focused on affordability as well as sustainability and is the preferred module supplier for major PV projects globally. · Terry Tamminen, CEO and Founder of 7th Generation Advisors, for his work in developing renewable energy solutions in California. For more than 20 years, Tamminen has developed, implemented and replicated effective renewable and sustainable energy solutions by using California as a proof-of-concept model, then scaling up to larger markets within the US and internationally. The Zayed Future Energy Prize is inspired by the vision and environmental stewardship of the late Sheikh Zayed Bin Sultan Al Nahyan, the founder of the United Arab Emirates. The Prize recognizes and rewards outstanding work in renewable energy and sustainability. For more information please visit www.ZayedFutureEnergyPrize.com.